Preface. 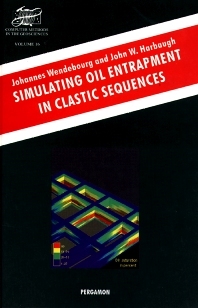 Rationale for Simulating Oil Migration and Entrapment in Clastic Sequences. The Continuum of Processes in the Real World Representing Space and Time. Spatial boundaries. Decoupling processes. Spatial resolution. Simplifying processes. Scale dependency. Overview of Migration and Accumulation. Source Rocks. Expulsion from Source Rocks. Secondary Migration. Migration rates and efficiency. Oil migration pathways. Migration under hydrodynamic conditions. Segregation and Change During Migration and Entrapment. Closing Statement. Generating Clastic Sequences. Types of Numerical Sedimentary Simulators. Geostatistical simulators. Geometric simulators. Diffusion simulators. Sedimentary process simulators. Comparison of numerical sedimentary simulators. Utilizing Process Simulators. Spectrum of process simulators. Calibrating and controlling process simulators. Boundary and Initial Conditions. Initial topography. Fluid and sediment discharge rates. Eustatic sea level changes. Uplift and subsidence. Depositional Environments. Fluvial environments. Deltaic environments. Oceanic environments. Submarine slope failure and turbidity currents. Recording Sequences Generated by Process Simulators. Cell height. Cellular storage by age. Reduction in number of cells. Integrating Depositional and Burial History. Limitations in Sedimentary Process Simulation. Mathematical representation. Resolution, scale, and grid dimensions. Decoupling processes. Limitations imposed by boundary conditions. Computing speed. Disk storage. Graphic display. Closing Statement. Endowing Simulated Sequences with Petrophysical Flow Properties. Porosity and Compaction. Compaction involving multiple grain sizes. “Chemical” compaction. Calculating porosity in simulated sequences. Permeability. Obtaining permeabilities empirically. Permeability based on the Kozeny-Carman equation. Capillary Pressure. Capillary pressure as function of wetting-phase saturation. Capillary pressure as function of pore-size frequency distribution. Relative Permeability. Closing Statement. Simulating Facies Relationships, Porosity, and Permeability in the Woodbine Formation of East Texas. Geology of the Woodbine Formation. Simulating Deposition of the Woodbine Sandstones. Initial topography. Defining a sediment source and grain sizes. The simulations. Results. Transforming Proportions of Grain Sizes to Porosities and Permeabilities. Burial and compaction. Cementation. Permeabilities. Variations in porosity and permeability. Closing Statement. Methods for Simulating Migration and Entrapment. Mass Balance. Pore-Scale Procedures. Hydrostatic Migration Procedures. Discrete interface procedure. Flow-line and particle-tracking procedures. Hydrodynamic Procedures. Basin-Scale Procedures. Finite-volume procedures. Finite-element procedures. Closing Statement. A Simulator for Oil Migration and Entrapment in Clastic Sequences. Fluid Continuity and Momentum Equations. Linking fluid flow with compaction. Coupled movement of solids and porewater. Equations for migration in a compacting sedimentary sequence. Solving the Two-Phase Flow Equations. Newton's method for solving non-linear systems of equations. Discretizing the Two-Phase Flow Equations. Flux and transmissibility. Geometric factor. Mobility. Potential difference. Accumulation. Petroleum fluid sources. Boundary Conditions. Solving the System of Equations. Implementation of Program Migrat. Experiments with Migrat. Buoyancy experiment. Capillary pressure experiment. Sediment-load experiment. Reservoir-simulator experiment. Closing Statement. Simulating Deposition and Migration at South Belridge Field, California. South Belridge's Geology. Depositional environment. Porosity, permeability, and oil saturations. Properties of crude oil. Simulating South Belridge's Prograding Delta. Transforming the Depositional Simulation for Migration and Entrapment. Simulating Migration and Entrapment. Boundary conditions. Charging the sequence in the simulation. Results. Summing It Up and A Look Ahead. Generating Clastic Sequences. Transforming Spatial Distributions of Grain Sizes to Petrophysical Flow Properties. Simulating Oil Migration. A Look Ahead. Notation. References. The book introduces procedures for simulating migration and entrapment of oil in three dimensions in sequences of sandstones and shales. A principal purpose is to show how simulation experiments can represent oil migration routes and predict places where oil may be trapped in sandstones and intercalated shales. The book derives the differential equations used to represent three-dimensional motions of porewater and oil in sedimentary sequences, and shows how the equations may be transformed into finite form for numerical solution with computers. There is emphasis on the graphic display of solutions, and results of example theoretical and actual applications are presented. The book is directed to geologists who have backgrounds in mathematics and computing and who are engaged in oil exploration and production. For petroleum geologists, petroleum engineers, computer scientists and oil explorationists.